I feel fragile like this bowl that was born with a crack that runs down from the rim, it still rings true though. Listening to Stefan Andersson on the Potters Cast I realised certain things about my work. I want my pottery work to evoke an emotion, to make people thing about the object and perhaps change their ideas. I am ruled by my emotions but feel uncomfortable sharing them professionally, despite that being what the pots need sometimes. A decade ago when I first came to art, I wanted to be a poet and I believed everyone should take up an art. It was perhaps the influence of Ruskin’s philosophies that they taught in art history, that a well educated person should take up an art. Along with that that it creates a well rounded person, but also I believed learning a skill was worth it for the pure enjoyment. In years since I have had people watch me draw, paint or make pots and woefully say I always wish I could have done that; unfortunately it can be hard to convince these people in a single meeting that they can draw/paint/pot. As a poet I never really put my pen down, I wrote day and night about what I felt. The more I wrote the more the words flowed from my pen. Eventually the words seemed to overwhelm me; I couldn’t focus for the flow of words. I also started to believe the quiet lies of those around me, that if it isn’t financially viable then something is not worthwhile. That books and stories sold more and were the way to make money, and that I should write those rather than waste my time on poetry. I never finished a book I wrote a few thousand words on three or four different stories, when it comes to writing to me my words feel like that of a peasant, an unformed write, a wannabe of the highest order. To finish a book requires around 90000 words, at the time it felt like that was far beyond someone who had been a poet, I wrote 1000 poems in a year; if the average for a poem was 60words that would be 60000 words which is 2/3 of the words needed to finish a so called serious book. Also if only 1% was any good like the work of any beginner then I only had 10 poems or 600words in a year. In the end I gave up poetry for a long time, it was only doing the Writing Matters course as part of the post graduate training courses that I took up reading and writing poetry again. It feels so much more natural to write that way compared to writing my dissertation. I now see each pot in the Lending Library or The Potter’s Archive as a poem made into a physical object, and then the writing alongside it tells the story of the poem. I haven’t yet managed to find a way to combine all these things into the object, or a way to easily attach the writing permanently to the object as a QR code would only really work on a black or a white pot. 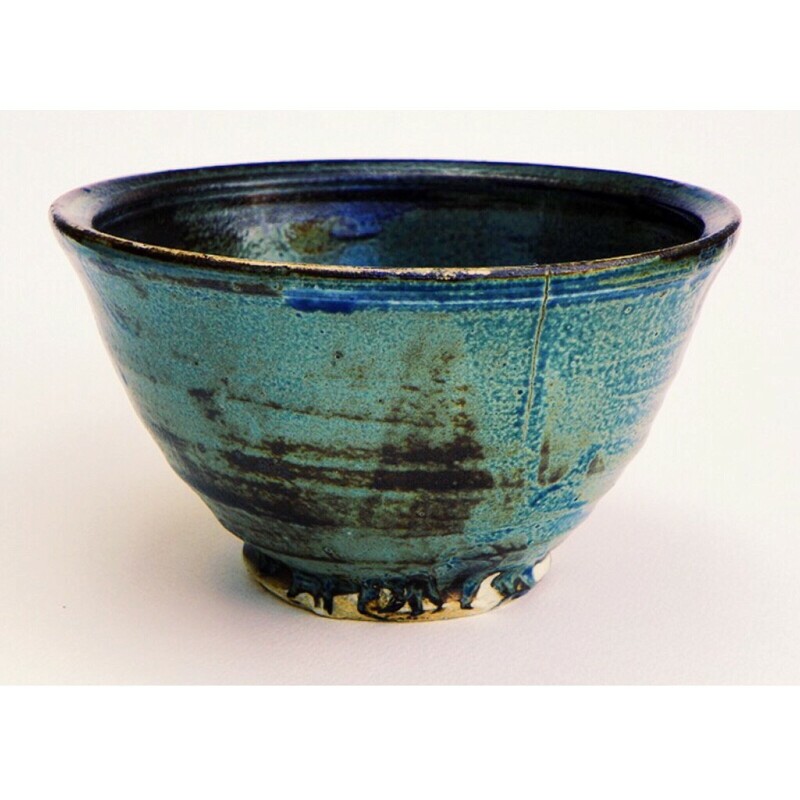 This entry was posted in Lending Library, storytelling and tagged blue, Bowl, ceramics, learning, making, Paul Blais, poetry, pottery, Stefan Andersson, storytelling, the past, The Potters Cast. Bookmark the permalink.